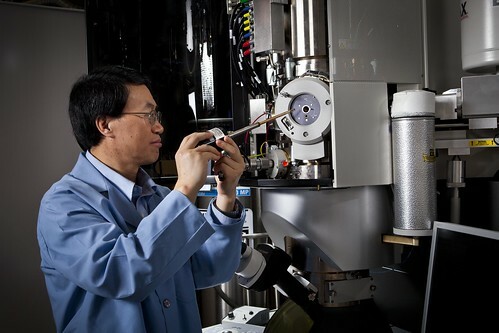 Extreme high resolution and other features of this transmission electron microscope at PNNL will help the design of new materials for energy storage and other uses as part of a new joint institute of PNNL and UW that is focused on the science of making materials. 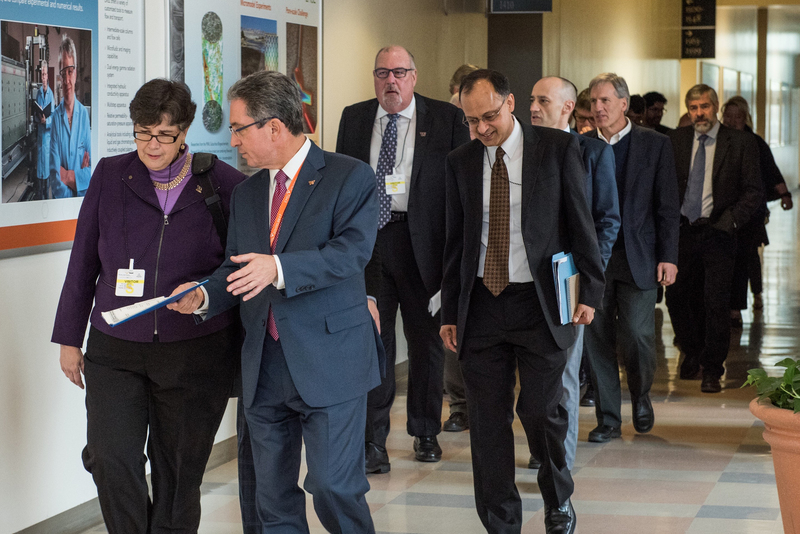 PNNL Director Steven Ashby leads a tour for UW President Ana Mari Cauce and UW staff through facilities that will be used in joint research through the newly formed NW IMPACT. RICHLAND, Wash. — Many innovations of 21st century life, from touch screens and electric cars to fiber-optics and implantable devices, grew out of research on new materials. This impact of materials science on today's world has prompted two of the leading research institutions in the Pacific Northwest to join forces to research and develop new materials that will significantly influence tomorrow's world. With this eye toward the future, the Department of Energy's Pacific Northwest National Laboratory and the University of Washington announced the creation of the Northwest Institute for Materials Physics, Chemistry and Technology — or NW IMPACT — a joint research endeavor to power discoveries and advancements in materials that transform energy, telecommunications, medicine, information technology and other fields. UW President Ana Mari Cauce and PNNL Director Steven Ashby formally launched NW IMPACT during a ceremony Jan. 31 at the PNNL campus in Richland, Washington. "This partnership holds enormous potential for innovations in materials science that could lead to major changes in our lives and the world," said Cauce. "We are excited to strengthen the ties between our two organizations, which bring complementary strengths and a shared passion for ground-breaking discovery." "The science of making new materials is vital to a wide range of advancements, many of which we have yet to imagine," said Ashby. "By combining ideas, talent and resources, I have no doubt our two organizations will find new ways to improve lives and provide our next generation of materials scientists with valuable research opportunities. The institute builds on a history of successful partnerships between the UW and the PNNL, including joint faculty appointments and past collaborations such as the Materials Synthesis and Simulations Across Scales Initiative, the PNNL-led Battery 500 consortium and a new UW-based Materials Research Science and Engineering (MRSEC) Center. But NW IMPACT is the beginning of a long-term partnership, forging deeper ties between the UW and PNNL. The goal is to leverage these respective strengths to enable discoveries, innovations and educational opportunities that would not have been possible by either institution alone. "By partnering the UW and PNNL together through NW IMPACT, the sum will truly be greater than the parts," said David Ginger, a UW professor of chemistry and chief scientist at the UW Clean Energy Institute. "We are joining together our expertise and experiences to create the next generation of leaders who will create the materials of the future." Ginger will co-lead the institution in its initial phase with Jim De Yoreo, chief scientist for materials synthesis and simulation across scales at PNNL and a joint appointee at the UW. Over the first few years NW IMPACT aims to hire a permanent institute director, who will be based at both PNNL and the UW; create at least 20 new joint UW-PNNL appointments among existing researchers; streamline access to research facilities at the UW's Seattle campus and PNNL's Richland campus for institute projects; involve at least 20 new UW graduate students in PNNL-UW collaborations; and provide seed grants to institute-affiliated researchers to tackle new scientific frontiers in a collaborative fashion. Materials for energy conversion and storage, which can be applied to more efficient solar cells, batteries and industrial applications. These include innovative approaches to create flexible, ultrathin solar cells for buildings or fabrics, long-lasting batteries for implantable medical devices, catalysts to enable high efficiency energy conversion and industrial processes, and manufacturing methods to synthesize these materials efficiently for commercial applications. Quantum materials, such as ultrathin semiconductors or other materials that can harness the rules of quantum mechanics at subatomic-level precision for applications in quantum computing, telecommunications and beyond. Materials for water separation and utilization, which include processes to make water purification and ocean desalination methods faster, cheaper and more energy-efficient. Biomimetic materials, which are synthetic materials inspired by the structures and design principles of biological molecules and materials within our cells — including proteins and DNA. These materials could be applicable in medical settings for implantable devices or tissue engineering, and for self-assembled protein-like scaffolds in industrial settings. "The science of making materials involves understanding where the atoms must to be placed in order to obtain the properties needed for specific applications, and then understanding how to get the atoms where they need to be," said De Yoreo. NW IMPACT will draw on the unique strengths and talents of each institution for innovative collaborations in these areas. For example, PNNL has broad expertise in materials for improved batteries. The lab also offers best-in-class imaging, NMR and mass spectrometry capabilities at EMSL, the Environmental Molecular Sciences Laboratory, a DOE User Facility. DOE supports fundamental research at PNNL in chemistry, physics and materials sciences that are key to materials development. The UW brings complementary facilities and equipment to the partnership, such as the Washington Clean Energy Testbeds and a cryo-electron microscopy facility, as well as expertise in a variety of "big data" research and training endeavors, highly rated research and education programs, and ongoing materials research projects through the National Science Foundation-funded Molecular Engineering Materials Center. The University of Washington was founded in 1861 and is one of the pre-eminent public higher education and research institutions in the world. The UW has more than 100 members of the National Academies, elite programs in many fields, and annual standing since 1974 among the top five universities in receipt of federal research funding.